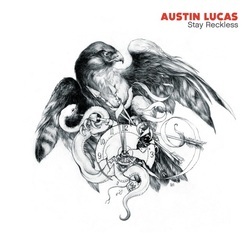 This is one of those albums that should perhaps be described as ‘country music as it should be played.’ Austin Lucas’ vocals have always had a distinct country twang, albeit with plenty of soul, similarly his songwriting and instrumentation and yet there is also at times a strong ‘rock sensibility.’Maybe that is more evident because the man seems to write naturally without any of the those unnatural affectations that so many others presume we, the music fan, wants. Austin is much travelled and steeped in genres that range from punk to folk and latterly country, it is easy to see and hear that he arrives at country music quite naturally although there is always the impression that his ‘punk side’ is never far away, giving him an edginess, even on some of his mellow ballads. He still spends time playing with ‘Guided Cradle,’ a band I’ve seen described as ‘heavy metal punk’ and even this probably underplays the hardness and malevolence of their music. Look them up on youtube after listening to this tremendous album and you will see the musical extremes that make Austin the talent that he is. On this, his fifth solo album he is helped out by old friends and hugely talented alt. country rockers ‘Glossary’ as well as well as Todd Beene of ‘Lucero,’ with Austin combining with ‘kindred spirit’ Mark Nevers as co-producers. punked up country of So Much More Than Lonely that in some way explains the experiences that enable the writing of sad country songs, a dominate feature of this tremendous album. Every time I play the album there seems to be a new revelation. I know this should happen with all albums and with many quality recordings it does, but rarely after the countless number of listening sessions I’ve had with these edgy tales. It would be tragic if all music fans weren’t exposed to music of this quality and originality. Great album!